Another big night for the Grizzlies Offense. 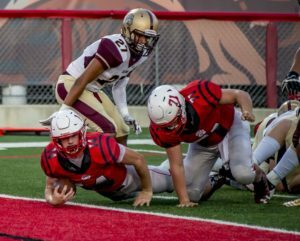 Wadsworth scored 9 straight touchdowns as they defeated Sylvania Northview 61-42 in the Division 2, Region 6 state football playoffs at Art Wright Stadium. The Grizzlies are now 11-0 on the season. Sylvania Northview ends the season at 8-2. The passing combination of Joey Baughman to Mitchell Blackburn was magic for the Grizzlies all game long. The duo hooked up for 5 touchdowns in the game. The TD passes were from 27, 37, 5, 13 and 11 yards. Joey had a 63 yard touchdown run to start the third quarter. Running back Brock Snowball scored three touchdowns on a pair of 1-yard runs and an 11-yard jaunt. The Grizzlies were down 14-0 in the first quarter, but battled back to tie it up at 29-29 at halftime. After the Baughman touchdown in the thurd quarter, Sylvania scored a TD. But, a blocked extra point by Brett Randolph gave the Grizzlies the lead for good at 36-35. The Grizzlies will play the winner of Olmsted Falls/Midview next Friday night at a location to be announced.